Make your vows at the magical and romantic La Bagnaia Golf & Spa Resort Siena, Curio Collection by Hilton. Breathtaking views of Siena, the hills, and the Tuscan countryside, combined with phenomenal hospitality and service, make this a fairytale wedding location. 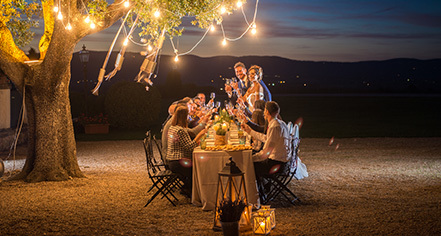 Host everything wedding related at this unique Tuscan resort, from engagement parties and bridal dinners, to wedding celebrations and receptions. There are over 1,000 acres to utilize for a one-of-a-kind wedding. Dance the night away under the starry sky on the Terrace Over the World. Or combine romance, relaxation, and elegance in the distinct Marmont Banquet Hall for up to 250 guests indoors. Hold a ceremony with spectacular views on La Voliera Terrace, perfect during sunset. Couples can rest assured that La Bagnaia offers dedicated wedding planners to personally take care of every detail, no matter how small, from start to finish. Also available at the resort are dressmakers, hairdressers, makeup artists, floral arrangements, photographers, live entertainment, and expert catering. This fabulous and romantic terrace is ideal for beautiful dinners, wedding ceremonies, and outdoor cocktail receptions, with its breathtaking views over the surrounding hills. When the sun falls, candlelight adds a touch of magic and makes it an unforgettable location for a wedding. This astonishing setting carefully combines romance, elegance, and a distinctively relaxing atmosphere for up to 250 invitees indoor. A spectacular patio offers fabulous views over Siena and the Tuscan countryside, perfect for cocktail receptions and banquets. This spacious outdoor area has spectacular views over the surrounding hills in the middle of the medieval village. Available for dinners and cocktails for up to 110 guests, it is perfect during sunset! La Voliera Restaurant features an intimate outdoor patio that can be used for smaller, private dinners and lunches. It offers breathtaking views over the Tuscan hills. The Pool Bar & Terrace is the perfect setting for a relaxing cocktail reception or pre-dinner event. It features a covered terrace and outdoor space by the bar. This area is ideal for a pool party with DJ, cocktail, pre-, and post-dinner entertainment area.